1. Two pieces of steel sheet are to be brazed. The steel must first be cleaned so that grease and dirt is removed. Wire wool or emery cloth are the most suitable abrasives. A borax flux (powder) is mixed with water to produce a paste which is brushed along the joint. Flux prevents oxidation taking place on the metal surfaces as this would prevent brazing being successful. 2. The compressor is turned on and this pressurises the gas and air. As the gas-air control is slowly turned on, gas is fed through the nozzle and this is ignited by a pilot light on the nozzle or by a match. 3. Once alight the gas-air control is turned to allow more air/gas through the nozzle which gives a longer, more fierce flame. The length of the flame can be adjusted with the control until the desired type of flame is achieved. As a rough guide, a blue section of flame will appear near the nozzle, the end of this is the hottest part of the flame. 4. The two pieces of steel should have already been placed on the rotating table. Fire bricks are used to raise both pieces slightly off the surface of the table so that heat can flow all the way round it. Fire bricks should also be placed at the back and sides of the metal so that heat does not escape and is reflected back. The steel is given a gentle overall heating first which raises the temperature slowly. This allows the steel to expand slowly and for the water in the flux to evaporate without moving the steel out of position. The flame is moved around the joint fairly quickly throughout this first stage of heating. 5. The flame is then moved forward with the blue tip of the flame nearly touching the steel. The focus of heat should now be on the joint, as the flame is slowly moved backwards and forwards along it. The joint will eventually become so hot that it becomes red in colour. 6. A brazing rod (copper-zinc alloy) is then pushed gently against the joint and if the temperature is right the end of the rod will melt and begin to run along the joint. The rod is fed into the joint until a brazed joint is complete. The steel is allowed to cool slowly. If cooled quickly, such as quenching in water, the joint can crack or become distorted. The diagram opposite shows how the copper-zinc alloy (brazing rod) forms a joint between the two pieces of steel sheet. EXTRA SAFETY: Using a brazing hearth and soldering/brazing is potentially dangerous as high temperatures are reached. Serious burns can result if safety procedures are ignored. Leather aprons and gloves will offer good protection if you accidentally touch hot metal. Goggles are essential as ‘splashes’ of hot flux or brazing rod (solder) could damage eyes permanently. Furthermore, if there is a need to pick up materials that have been heated on the hearth, always use steel tongs and place the hot material on a steel plate/block. The steel block/plate will conduct the heat away from the material without cooling it too quickly. 1. 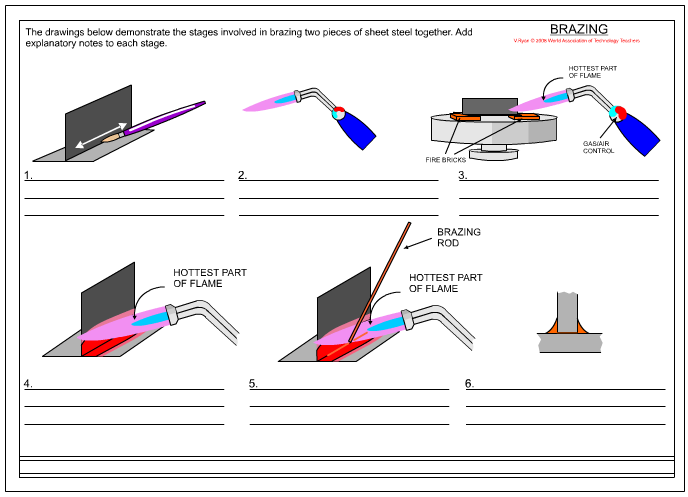 Draw a series of diagrams that represent the stages involved in brazing two pieces of steel. Add notes. 2. Explain the safety procedures when brazing.